is in full swing this Sunday, September 11th. The tour showcases five stunning west-side gardens, proceeds benefiting Ainsworth Elementary School's PTA. I visited a few gardens from this tour last year, those posts can be revisited here, here and here. There were some amazing sights last year, this year proves to offer the same. Last week I made a rare trip into Portland as two of my garden blogging friends (Loree of Danger Garden and Amy of The World's Best Gardening Blog) and I were fortunate enough to preview one of the gardens open for viewing. I invite you to come along with me and take a virtual tour. A secret garden awaits you! Manicured boxwoods in front give only the slightest hint of what awaits beyond. The owner has transformed what was once a treacherous blackberry-filled slope into a tranquil space for painting and reflecting, combining found objects from the past with Mediterranean inspirations and sweeping views. The gardener behind this wonderful space is Ellen Novy. Ellen shared with us that she purchased this home in the 1970's and at the time it was a blackberry-filled slope in need of a lot of love. The front of the home has virtually no front garden at all, but worry not! The back is a wonderful surprise. As we rounded the side of the home we came across this vignette. An area for Ellen to relax and enjoy views of the garden below as well as do a little painting plein air. The back of the home with the painting area just under the porch on the left. The adjacent homes in the area were once one large property with this being what Ellen believes to have been the servants' quarters. Below this house was the carriage house, now long gone. The garden is on a slope. These stairs lead down to a gravel drive and more surprises. This tunnel of green was a cool shady surprise. It adds to the lush tropical feel of the neighbor's garden below. Technically, this is the neighbor's garden but it is part of what you'll see when visiting. The Hakonechloa macra 'Aureola' in this bed was stunning. This is where the original carriage house was sited. A look back through the tunnel to fellow blogger Amy Campion of The World's Best Gardening Blog. She's a modest one, that Amy! As a side note, watch for a book she co-wrote with Paul Bonine about gardening in the Pacific Northwest coming out next year, published by Portland's own Timber Press. Way to go, Amy! From below looking up at the house. That is a steep slope! I can imagine that clearing blackberries from this site was an especially daunting task. Now it's a sweet garden with old-world charm. Now to the heart of this garden. On a clear day there are fantastic views beyond. The structure with the rounded roof in the background is the neighbor's that we just saw. This charming garden shed is not only functional but also inspiration for some of her paintings. There are many sweet touches to this garden. This kitty was just one. Many seating areas, clipped boxwood hedges and topiaries define the spirit of this place. Pops of color make this a whimsical place. In the foreground a marble rabbit stands guard. The arbor frames the entrance to the garden shed nicely. Chicken! Loved this little planter. There's the artist and gardener herself, busily getting ready for this fantastic tour. Thank you, Ellen, for opening your charming garden to us! 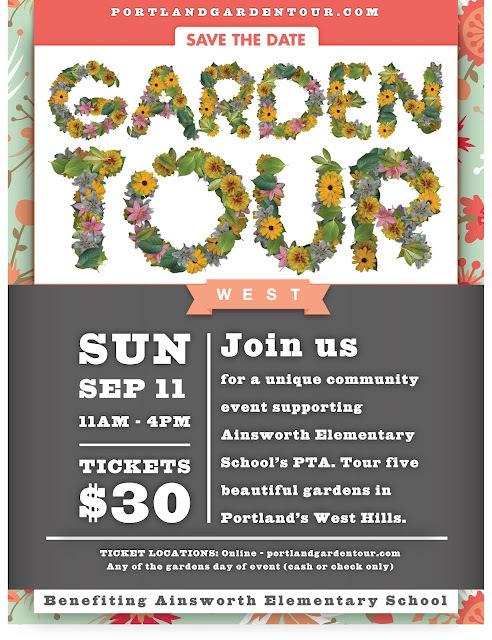 The tour is a self-guided event on Portland's west side. The hours are 11 a.m. to 4 p.m. Tickets are available online or at Cornell Farms, Zupan's on West Burnside and at any garden on the day of the event. Visit the website for more information and frequently asked questions. You can start the tour at any one of the five gardens, too. More information can be found here. There is one other event this same day, Sunday September 11th at 1pm. At Joy Creek Nursery where I work, I will be hosting Loree Bohl of Danger Garden and Amy Campion of The World's Best Gardening Blog for a discussion about garden blogging and using it as a tool to build community, hone writing and photography skills and, most importantly, to connect with people. If you find yourself in Scappoose, Oregon please join us! The event is free and open to the public. More information can be found here. That's it for this week at Chickadee Gardens. As always thank you for reading and happy gardening and touring, too! Looks like a lovely garden. Wish I lived closer so I could do the tour. Good luck on your presentation! The old, settled Ainsworth neighborhood and the hilly terrain create a setting like no other. This garden looks to have taken full advantage. Yes, she did! It's a lovely garden full of that good ol' English charm. A September garden tour is something you'd probably never find here, where gardens are usually at their worst after a long hot, dry summer. You live in a garden paradise! Thanks for sharing this wonderful garden and best wishes with the presentation on Sunday. Oh, that's too bad. They are starting to look kind of scraggly here but boxwoods always look neat and tidy! The red and the statuary were very charming. But yes, a bit of a drive for you, Laurin!! Absolutely gorgeous! Thank you so much for sharing this lovely tour! Yes, a lovely tour - check out Danger Garden's post last week, she has another garden from this same tour highlighted. Lovely garden. That stone stairway flanked by stone walls is very special. I hope the tour is a great success.